E-mails form an important aspect of the day-to-day life. Due to the fact that it is extremely convenient and simple to use, it has caught on with the people in a huge manner. The popularity of e-mails has led to the presence of numerous e-mail services. Here are some of the top email services. offered by the search engine giant Google, Gmail offers free e-mail accounts. 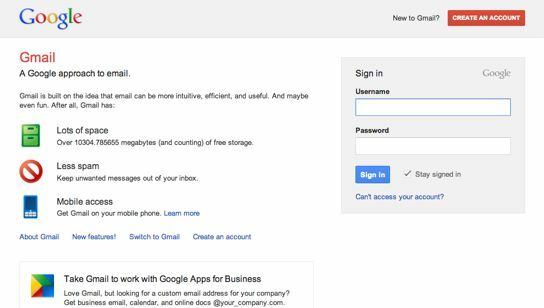 Gmail integrates a number of other apps from Google in one place. Gtalk is one of the popular integrations of a Google app within Gmail. It allows users to perform voice and video chats for free. Each user gets just over 10 GB of space, while the storage capacity can be increased as well. For business users, they offer Google apps which is free for small team and individual users and $5/user/month with additional features and more data. Earlier known as Hotmail and now Windlw live mail is a collection of numerous services, with one of the chief being the mail service from Hotmail, from Windows. Microsoft manages to integrate the likes of the Outlook accounts, SkyDrive, Hotmail, and other popular Windows services in one roof. Windows Live also features the upcoming replacement for Hotmail e-mail service as well. There are numerous applications like messenger and writer present as well. They recently launched cloud based, free and modern email service Outlook.com, which is likely to replace hotmail soon. Started in 1997, Yahoo mail offers unlimited storage space for its e-mail users. Instant photo viewing, quick reply, mobile mail services, and instant messages are some of the aspects of this mail service from Yahoo!. This service also integrates the Yahoo! messenger allowing users to chat with friends. This e-mail service allows users to send files of up to 100 MB each. This is a free e-mail service offered by AOL. Users can attach files of not more than 25 MB in size within each e-mail. This service is offered alongside the instant messaging service from the same company. Unlimited storage capacity is provided to every user. This free e-mail service from GMX claims to have more than 13 million members in its ranks. SSL encryption is provided as standard to the users for maximum security. The account can be accessed even from a mobile device as well. This free e-mail service comes with the ability to send and receive files of up to 25 MB. Users will get the option to store 5 GB of data for free, while storage capacity can be increased by purchasing more space. Spam and virus protection are provided as standard. Mail.com provides a free email service that comes with features like unlimited email storage, spam filter, virus protection, and ability to access the account from a mobile. The service claims to have more than 30 million users worldwide. It is a part of UK based leading web hosting company 1&1. FastMail provides e-mail service for both home and business users. Family accounts can also be set up, while all the services come standard with features like junk mail protection and high levels of security. The business e-mail service costs $90 for five users. Hushmail offers a business email service with features like a 10 GB storage capacity for each user. Email addresses can be customized to have the company name in the domain name. This email service is offered in two plans. This is a free email service that can be availed in the Opera browser as a built-in application. The account and the mails within can be accessed even when offline. The email client also offers a low bandwidth mode and spam filter. Zoho Mail is primarily meant for business users. The service is free for up to 3 users, while users will get a 10 GB account for USD $2. Each account comes integrated with more than 10 commonly used business applications. Lycos Mail offers an advertisement supported free email service, while the paid service removes the ads and offers increased storage capacity of up to 5 GB. The storage capacity of a free account is 3 GB. Features like spam filter and virus protection are standard on the free and paid services. My Way offers a free email service that comes with 125 MB of storage per user. Files of up to 10 MB can be attached in each email. It is possible to access other popular email services like Yahoo! Mail and Hotmail from My Way. This is an email service from leading Russian search engine giant. Yandex Mail provides social networking integration within its free email service. Each account can be customized using more than 30 themes available. The account can be accessed from a mobile device using the official app, while spam filter is standard with each account. Rediff.com offers an email service that is free and comes with unlimited storage capacity. Many languages are supported by this mail service. The account can also be accessed using official mobile applications available for several platforms. Runbox offers a professional email services with four different plans that start from $1.66 per month to $6.66 per month. Web and email hosting services are offered in certain plans along with features like email consolidation, virus protection, and spam filter.